Favorite Line: "You've both acted understandably, but that does not by any means mean that either of you has behaved well." Starred Review. The originality of Rothfuss's outstanding debut fantasy, the first of a trilogy, lies less in its unnamed imaginary world than in its precise execution. Kvothe ("pronounced nearly the same as 'Quothe' "), the hero and villain of a thousand tales who's presumed dead, lives as the simple proprietor of the Waystone Inn under an assumed name. Prompted by a biographer called Chronicler who realizes his true identity, Kvothe starts to tell his life story. From his upbringing as an actor in his family's traveling troupe of magicians, jugglers and jesters, the Edema Ruh, to feral child on the streets of the vast port city of Tarbean, then his education at "the University," Kvothe is driven by twin imperatives—his desire to learn the higher magic of naming and his need to discover as much as possible about the Chandrian, the demons of legend who murdered his family. As absorbing on a second reading as it is on the first, this is the type of assured, rich first novel most writers can only dream of producing. The fantasy world has a new star. It is always hard for me to pick a book to read after one that I really enjoyed. It is really probably unfair to the next book as I'm usually just disappointed in it, when compared to the one that came before. I was not disappointed in The Name of the Wind, though. This book has gotten so much hype in the fantasy book-reading world that I had to buy it. This actually says a lot, considering the significant decrease in the number of books I have purchased over the past year. This says a lot about how well marketing works on people like me. I also bought Jonathan Strange & Mr. Norrell (which I enjoyed), The Historian (which I did not) and The Lies of Locke Lamora (which, again, I did), all of which were hyped up beyond belief as well. It seems like there has to be The Next Big Book in Fantasy introduced every year or so. Which is fine, but inevitably can lead to disappointment on the part of the reader. Before I get to anything else about this book, I'd just like to take a moment to air a grievance, Festivus-style. I purchased the third edition of the hardcover a few months ago. I cannot believe (really, cannot believe) the number of typographical errors there were. It wasn't as though they littered every page, but there were enough for me to notice several and I think that is ridiculous. Publishers should edit their books closely in general, and by the third printing, those errors should be found and fixed. It is very disturbing to me that there were still a handful of typos in the edition of this book that I purchased. As I generally really enjoy Daw's books, I hope they are not becoming less careful about this. In any case, The Name of the Wind is a very good story. It is not by any means ground-breaking fantasy, however. The book is the first in a projected trilogy (really, how many fantasy novels are not the first in a projected trilogy? ), and tells the story of an extraordinarily precocious boy whose family is killed and then goes out to seek the wrongdoers. Pretty standard. Any fan of fantasy knows, though, that plot is only one small part of the magic. Most of the artistry lies in characters and in world-building. 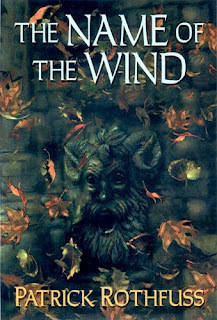 The Name of the Wind is told mainly in the first person, which is a departure from the norm for the genre. Through this narrative format, we learn a great deal about the main character, Kvothe- the way his mind works, his feelings and his reasoning- but we get very little insight into very many of the other characters. For example, Kvothe's two closest friends at University are named Sim and Wilem. They seem good sorts, in general, but I don't think I could say I knew much about them at all. Maybe that's because they aren't central to the story, though, as some of the other characters- Abenthy, Kvothe's first teacher, and Denna, his love interest- get spotlighted quite a bit. I like the first person narrative as future-Kvothe seems to be a pretty fascinating person. However, teenage-Kvothe is the main character in the story, and he can get a bit tiring. Hopefully he does some quick maturing in the next couple of books. It wasn't that he was unlikable at all. He was just such a teenager- sometimes so cocky and arrogant and rude for no purpose, and sometimes so completely the opposite that you'd think he was a different person. But it says a lot about Rothfuss that he captured the age of his character so well! The world-building aspect of the novel is where it fell just a little short for me, and I think this is due to the first-person narrative. We are limited to knowing only what Kvothe knows and sees and hears, and so we have no real scope of how large the world he lives in is or who the major players in it are. I only know what Kvothe decides to tell me. This can be extremely frustrating, but it also means that there may be many more interesting stories and folklore shared in the coming books- I hope so! What I have seen and heard of Kvothe's world is intriguing so far, but it is impossible to put together any of the parts into a cohesive structure. Meaning- I read the story and was interested by it, but I am not entirely certain that I know what it is even about. That said, I'm very happy to hear that the next installment in the series will be published in April so that I can continue learning about Kvothe and his world and his friends. I have a feeling the series will be one that holds my interest while I read it, though I am not quite sure if it is destined for my keeper shelf. It takes a lot to keep company with the likes of Guy Gavriel Kay, George R. R. Martin, Diana Wynne Jones and Teresa Edgerton! I really need to get around to reading this book! I have picked it up so many times with the intention and just never got around to it!